‘The misery of superstorm Sandy’s devastation grew Tuesday as millions along the U.S. East Coast faced life without power or mass transit for days, and huge swaths of New York City remained eerily quiet. The U.S. death toll climbed to at least 48, many of the victims killed by falling trees, and rescue work continued. The storm that made landfall in New Jersey on Monday evening with hurricane force cut power to more than 8.2 million across the East and put the presidential campaign on hold just one week before Election Day. (NaturalNews) Delta Airlines, in collusion, of course, with the Transportation Security Administration, seems to have a new division: Thought Police. Writing on his blog, Guha – who was returning home after attending his grandfather’s funeral – tells how he was treated as a terrorist for nothing more than his attire which, he explained, puts a sarcastic spin on the screening process airline passengers in the U.S. must endure. “The story begins on Saturday, August 18,” Guha, who describes himself as a PhD at Arizona State University’s School of Sustainability, says. Hactivist group Anonymous claims to have taken down the websites of Interpol and a British police force as part of a campaign calling for the freedom of WikiLeaks founder Julian Assange. A Norwegian court has found that mass killer Anders Behring Breivik is sane and sentenced him to 21 years in jail. Breivik admitted killing 77 people and wounding more than 240 others when he bombed central Oslo and then opened fire at an island youth camp last year. He insisted he was sane and refused to plead guilty, seeking to justify his attacks by saying they were necessary to stop the “Islamisation” of Norway. Prosecutors had called for him to be considered insane. 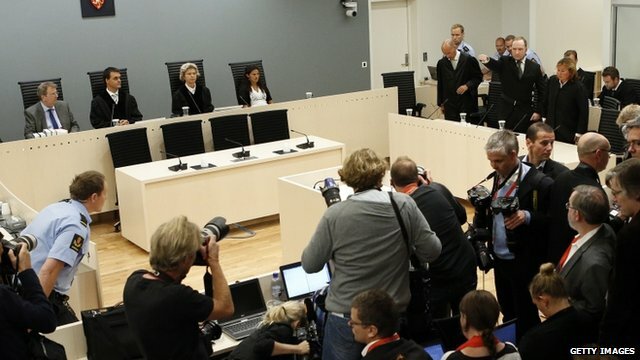 The five judges were unanimous in ruling that Breivik was sane. He was convicted of terrorism and premeditated murder, and given the maximum sentence of 21 years’ imprisonment. However, that can be prolonged at a later date if he is deemed to remain a danger to society. Delivering the verdict, Judge Wenche Elizabeth Arntzen imposed a sentence of “preventive detention,” a special prison term for criminals considered dangerous to society. She set the minimum length of imprisonment to 10 years. Several British governmental websites, including the Ministry of Justice, have been attacked by hacktivists in retaliation for Britain’s handling of WikiLeaks founder Julian Assange. Under the campaign, which was branded “#OpFreeAssange,” Anonymous undertook a mission to take down justice.gov.uk and number10.gov.uk, the official site of the British Prime Minister’s Office. The websites are now operating normally once again. Several Twitter accounts associated with the loose-knit Anonymous collective have acknowledged that the UK Ministry of Justice and the PM Office’s websites had been targeted with a distributed denial-of-service, or DDoS, attack. The hackers also claim to have taken down the website of another British government department – the Department of Work and Pensions. “Gov. of UK Expect Us!” reads a related tweet by Anonymous.